2. In the home screen, select Free Flight Mission. The map view is loaded. If internet connection is established, a background map is displayed. The mission can also be prepared in the office. 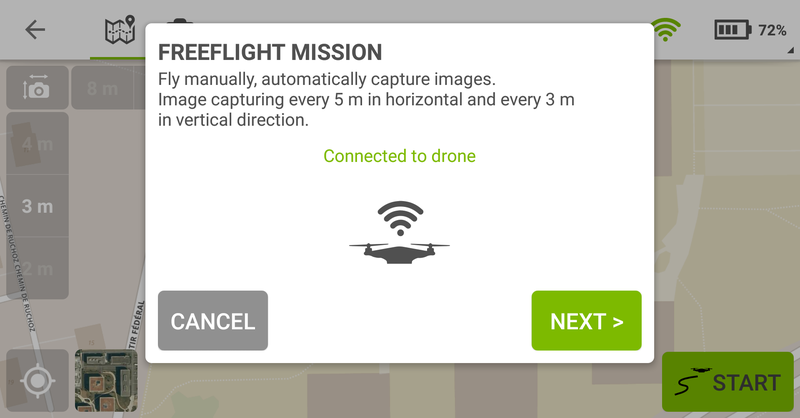 The displayed map is cached in memory and will be available when starting the mission in an area without the Internet connection: (Android, iOS) How to plan and fly a mission without Internet in the field. 3. (optional) On the left of the screen, change the settings of the free flight (horizontal and vertical image spacing). By default, the horizontal and vertical image spacing are set to 5 meters (Android) or 3 meters (iOS) and 3 meters respectively. This is well suited to reconstruct an object at a distance of approximately 20m. It is recommended to choose the horizontal and vertical image spacing that there is enough overlap between the images. For more information about optimal flight plans: Step 1. Before Starting a Project > 1. Designing the Image Acquisition Plan > a. Selecting the Image Acquisition Plan Type. 4. Center the map on the area of interest: (Android and iOS) How to use the geolocation options in the Map view. Once the mission has been prepared, it can be started. 1. 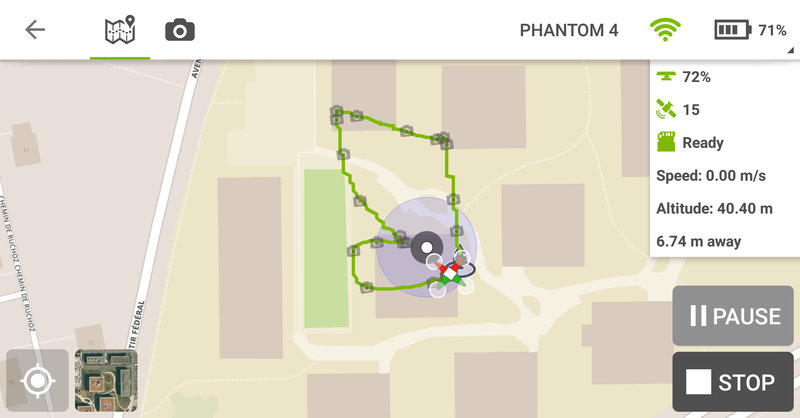 Place the drone in a clear area of at least 10 by 10 meters that can get easily GPS signal. 2. Turn on the remote controller. 3. Turn on the drone. 4. (DJI) Set the drone to be flown in manual mode by switching the corresponding button on the controller. 5. In the app, tap Start. The drone will not take off at this points. 6. Check that the app is connected to the drone. If yes, tap Next. 7. Verify that all security checks that are displayed are green. If yes, the drone can start taking pictures. If not, solve each security issue until it becomes green. For more information about how to solve the security issues: (Android) Takeoff checks fail. 8. Manually take off and fly towards the area to be mapped. 9. Tap on the button Take Pictures (Android) or Start (iOS) to start taking pictures. 10. Fly over the area of interest until images have been taken to cover the whole area. 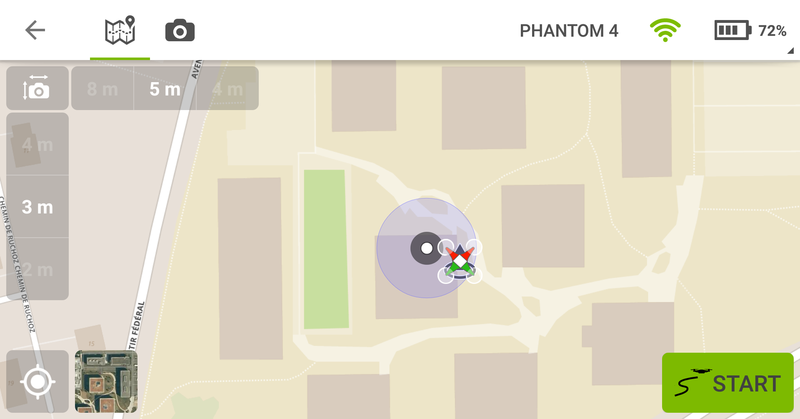 The map view displays the current position of the drone. It allows keeping track of the mission. When the drone reaches the mission altitude, check that the camera is pointing towards the area of interest. It can happen that the gimbal is not properly initialized and that the camera is not looking in the correct direction. The gimbal can be manually changed during flight by going to the camera view and pressing the down arrow. The signal to take a picture is sent from the app during the mission. If there is an issue with the app or the device, no images are taken and the mission has to be redone. Don't fly too fast. If you fly too fast, the app will not be able to record the images at the requested intervals. If pictures are missing over an area, fly back to that area. The app will record the missing pictures. 11. When the area has been covered, tap Stop (Android) or Abort (iOS) to end the image acquisition. 12. Land the drone and synchronize the images with the device and upload on the cloud following: Pix4Dcapture - Getting Started. 1 -When i use FREE FLIGT mode, i can not hear shooting sound. 2 -When i need manually picture and also i can not doing this with remote control. Could you help me please. What should i do ? 1. Even if you do not hear any shooting sound, the most important thing is to look if the pictures are taken by watching on the application when flying. A little camera will pop up along your flying path for each picture taken. 2. You do not have the possibility to manually take a picture when using Pix4Dcapture and running a Free Flight mission as it has not been implemented in the application. In your case, the issue is due to the fact that the SDK that allows the communication with the drone's firmware, cannot interact with both Pix4Dcapture and DJI GO 4. I will take the opportunity to share with the developer's team your feedback so that they consider to implement a feature to take pictures manually. Thank you for your clear answer. But i remember, when i were using P4P with Pix4DCapture on Free Flight mode i can take the picture while drone flying and also i can here the click sound. Sometimes operator not control the speed and drone cannot take the picture in the line and when i notice this i go back and push the button and take the picture. On my side, i have tried today P4P V2 and i see my drone is taking picture even i flying free mode. But just i can not here the sound. (i have checked also clik sound in DJI GO, it was working i can here very well ). It was not big deal but sometimes if the drone is pas the line without the picture i can control this because of sound. If you want me to try something for this issue i would gladly try. I have a different question, In any way is it possible to automatically give a vertical flight mode to the drone so that it flies to a specific height let say 20meters and then comes down waiting 1 min every 1 meter ?? The Free Flight mode is semi-automatic, meaning that the control of the drone is manual and the picture triggering is automatic up to the vertical and horizontal distance you defined in the settings. However with the Free Flight mode nothing prevents you to go to 20m high with your drone and slowly go down manually. Pictures will be triggered automatically every x meters. There is currently no possibility in Pix4Dcapture to fly a kind a "vertical" Grid mission automatically. Is the synchronization necessary? Can't I just load the images form Phantom SD card? In any case and also with the other types of mission, you can get the images acquired straight from the SD card plugged on your drone. The synchronization is not mandatory and is here to optimize the workflow at the end of a mission so that the user can quickly look at his pictures to see if everything went fine or to upload them on the Pix4DCloud in order to be processed directly. 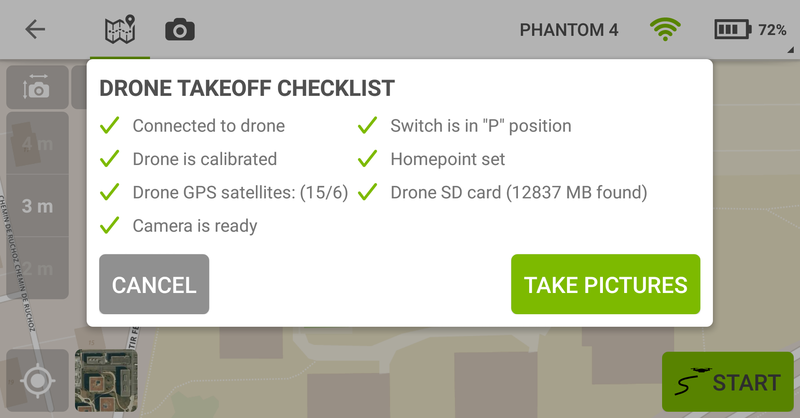 You can cancel the synchronization and get the images on the SD card if it is taking too much time (for example if your number of images is big) or if your drone battery is low. Also, in the general settings, you can deactivate the automatic download drone --> mobile device at the end of a mission if you prefer to operate this way. I want to map the top of a cliff which is at least 500 AGL from where I can launch legally. The cliff top has no access without a lot of hassle. I can launch from a public park below the cliff, but cannot map because the PIX4D Capture App limits me to 150 meters (~500 feet) above the launch point. I want to use the app because of the ability to take pictures automatically at regular intervals to do a contour mapping run. I plan the run to be about 150-180 ft above the clifftop to get the proper results. This means from launch I will need to go about 680 ft vertically. This is legal as long as I stay close to the cliff and fly not more than 400 feet above the clifftop when over it. The real question is, How can I accomplish this with your app, as it limits me from the launch point to 150 meters? I could do the mission in the Free Flight mode, right, but is it limited to 150 meters? You should be able to realize the mission you are describing using Pix4Dcapture and fly above 150m in a Free Flight mission. - Make sure that in DJI GO 4, the Set Max Flight Altitude parameter is set to a value that will not conflict with Pix4Dcapture and that for example the beginner mode is not activated. - Using the iOS version of Pix4Dcapture, you should be able to fly up to 500m in a Free Flight mission and also on Android. However, on Android, you should tick in the general settings the option Enable advance mode to bypass the default height limit in Pix4Dcapture which as you wrote 150m. Also, even if it seems that you looked at it, be sure that your flight will be done legally regarding the drone regulations of the country where you operate. I have a DJI P4P pro and a Parrot anafi. I want to use my anafi for a free flight mission during a bridge inspection. I Want to visualize intrado of bridge and my P4P pro aren't able to do this. Do you want to improve pix4D capture for this? If yes, do you have a schedule for this? Free Flight mode is not implemented for the Parrot Anafi yet. Currently, you won't be able to make Free Flight missions with the Parrot Anafi drone. I would suggest you follow the thread which is about a similar topic. If possible, can you send screenshots of the issue experienced? I would suggest you go through the basic checks and troubleshooting first to see if it can solve the issue. Also, are you updated with the latest drone firmware and Pix4Dcapture versions? Do you have internet access when flying this mission? Have you tried to use another mobile device? About the map not being displayed, it can be related to the issue describe and solved on this thread.